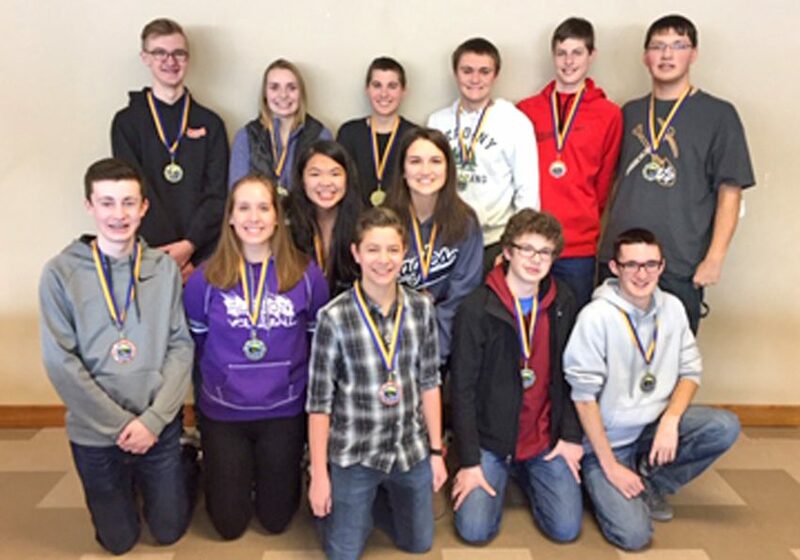 In what might be a first for EV-W knowledge bowl, all three teams participating in the Feb. 1 conference knowledge bowl meet at Kimball, came home with medals around their necks. The varsity team of Kennedy Kleist, Wyatt Schmidt, Derek Utecht and Cory Zimmerman edged Melrose to capture first place. The EV-W team finished with 96 points. Melrose was second with 93 points and Holdingford I was third with 81 points. In the junior varsity division, the EV-W team of Abigail Holmberg, Zach Kuechle, Seth Roeser and Nick Zadra finished first with 100 points. Melrose was second with 66 points and EV-W’s junior varsity II team of Hailey Gruber, Mady Haag, Ben Ruhland, Ben Teicher and Hunter Weiss placed third with 59 points. Winsted, Kimball, Litchfield, Mayer-Lutheran and Melrose compete in four conference meets during the season. Points are accumulated at each meet to determine a final champion. After two meets, Melrose leads EV-W in the varsity division, 194 to 185. Litchfield I is third with 146 points. In the junior varsity division, EV-W junior varsity I has a commanding lead with 202 points. Melrose is second with 122 points and Mayer Lutheran is currently third with 115 points.